Cut the Rope 2 brings fresh challenges and unanticipated obstacles to the candy crunching, physics-based phenomenon that has delighted millions of players around the world! If you like Cut the Rope, you&rsquo;ll love Cut the Rope 2! In his unexpected adventure, Om Nom breaks out of his box and travels through lush forests, busy cities, junkyards and underground tunnels, all in pursuit of one goal &ndash; CANDY! Along the way, he encounters the Nommies, the cutest candy collecting helpers a little green monster could wish for! 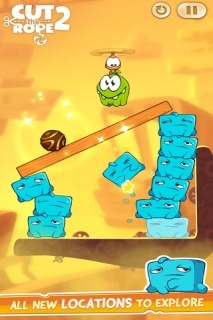 MEET OM NOM&rsquo;S NEW FRIENDS, THE NOMMIES! Don&rsquo;t waste any time - exciting surprises await! Help Om Nom find his way home...out of the forest, through a pond and a junkyard, into the city and beyond! Cut the Rope 2 supports high resolution for an optimal gaming experience on both phones and tablets. Escape Games - Car Wo..
Cut The Rope Experiments FREE ..
Cut The Rope For Android Phone..
Cut The Rope HD Lite For Free ..